Effective for cases which have not improved with other treatments, and for chronic pain or numbness. The gentle techniques we use gradually remove distortions of the spine, so they can safely be used on all ages from children to adults. Smart phone syndrome is mainly caused by straight neck. CBP® treatment restores normal neck curve. We perform a detailed evaluation of the patient in terms of exercise, nutrition, sleep, environment(stress) to work toward improvements in daily life. If you are worried about your child's posture, we recommend not waiting to come in for a consultation. We handle major types of insurance. Contact us in either English or Japanese. When seen from the front, the ideal spine is straight. When seen from the side, the neck, upper back, and lower back each have their respective curves. 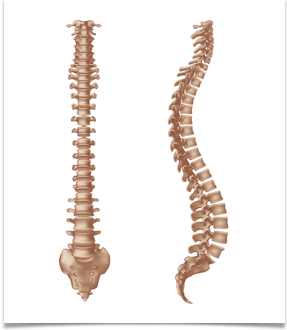 What does your spine look like? By analyzing patients' X-rays, we identify the root cause of pain. By improving posture and correcting abnormal spinal misalignment, we achieve more permanent relief. Effective for straight neck and scoliosis, also.